 Your Donation will help area Lancaster-Fairfield County Children. Click and print donation form. 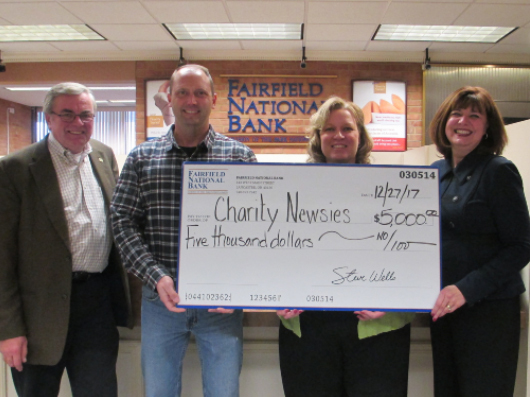 The Fairfield National Bank recently donated $5,000.00 to the Lancaster-Fairfield County Charity Newsies recognizing the Newsies for their year-round charitable work within Fairfield County. The Lancaster-Fairfield County Charity Newsies, founded in 1936, will be delivering 500 Christmas food baskets to less fortunate families throughout Fairfield County Saturday the 22nd of December; 125 Newsies will pack the baskets Friday night December 21st at the warehouses of Jerry and Kenny Sprague’s Hamburg Fireworks. Frozen meats, etc. plus white and chocolate milk will be added Saturday morning just prior to delivery - as will be bread. Generally speaking, a typical basket contains enough food and sundry items for a local family of four for some two weeks. Most Newsies members make sure baskets going to families with children also have age and gender specific gifts/toys. Kenny and Jerry Sprague are Newsies past presidents; Kenny currently serves as Newsies trustee. 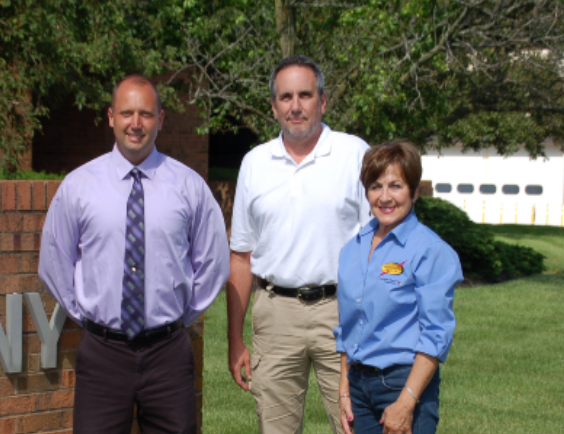 Pictured L-R: Tina Taley, Jim Lehman, Mike Purcell and Laura Tussing. Taley, a Newsies, is with FNB as is Tussing. Lehman is Newsies 2018 1st vice president; Purcell is president. Lancaster Fairfield County Charity Newsies received a $1,000 grant from the Lancaster Eagle Gazette. These funds will be included in the Christmas Food Basket event in December, where we stock over 450 food baskets to help families in need during the holiday season. The baskets generally contain enough food for a typical family of four for about two weeks, plus sundry items. The impact of living with an open hand goes far beyond what the eyes can see. It’s what our eyes don’t see - a family kept warm by being properly clothed, a child adequately fed and equipped in order to enhance and maximize his or her ability to learn. The Newsies are proud to serve our community alongside such an incredible, passionate and team of people as Eagle Gazette. Thank you for supporting the Charity Newsies, Mike Purcell II, Newsies 2018 president. 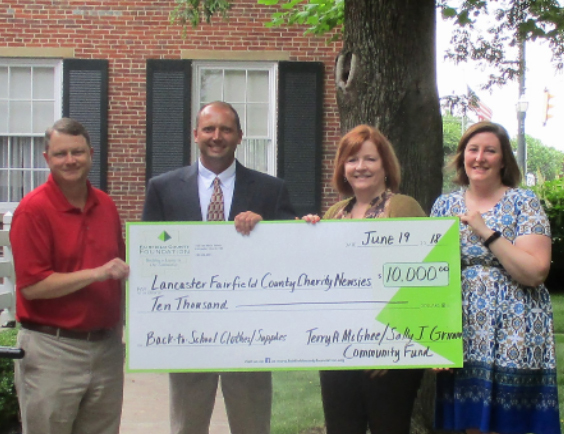 Lancaster Fairfield County Charity Newsies received a $10,000 grant from the Terry A. McGhee and Sally J. Grimm Community Fund of the Fairfield County Foundation. These funds will be included in the estimated $100,000 your local Newsies will invest in new “Back-To-School” clothes for some 1,000 less fortunate Fairfield County students from more than 450 poverty level families this August (2018). Newsies try to provide two complete changes of clothes including pants, tops, packages of socks and gender-specific underwear. Newsies frequently provide shoes, winter coats, boots, hats, gloves/mittens. Due to inevitable ‘accidents’ by children in early elementary, Newsies provide in classroom emergency clothing. Lancaster-Fairfield County Charity Newsies, founded in 1936, believe children must be properly fed, clothed and equipped to maximize learning. Pictured (L-R): Jay Nauman, Charity Newsies trustee and a past president; Mike Purcell, 2018 Charity Newsies president; Amy Eyman and Abby King of Fairfield Foundation. 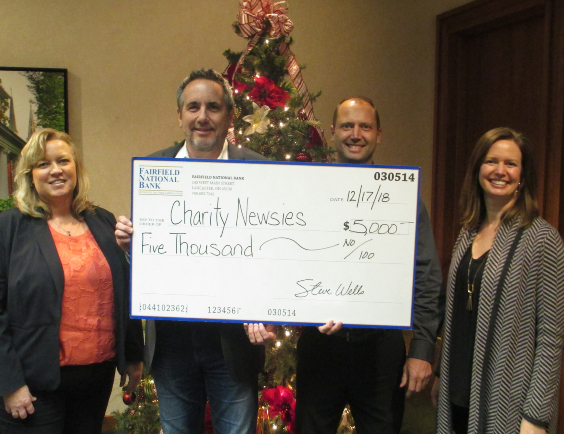 Lancaster-Fairfield County Charity Newsies a grant of $3,000.00. These funds will be included in the estimated $100,000 your local Newsies will invest in new “Back-To-School” clothes for some 1,000 less fortunate Fairfield County students from more than 450 poverty level families this August (2018). Newsies try to provide two complete changes of clothes including pants, tops, packages of socks and gender-specific underwear. Newsies frequently provide shoes, winter coats, boots, hats, gloves/mittens. Due to inevitable ‘accidents’ by children in early elementary, Newsies provide in classroom emergency clothing. South Central Power’s “Round Up” charitable grant program allows the company’s members to “Round Up” their monthly electric bill to the next $1.00; due to members generosity the company awards more than $500,000 every year to charitable entities such the Lancaster-Fairfield County Charity Newsies plus schools, civic groups, food pantries, fire departments and other worthy recipients throughout the company’s service area. Judy Shupe, South Central Power board member. 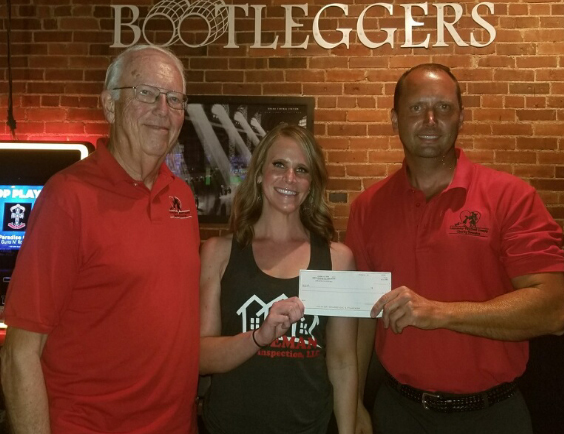 Pictured L-R: Paul Kasler, Charity Newsies member, Leah Blevins, Co-Owner of Bootleggers, and Mike Purcell, Newsies 2018 president. The impact of living with an open hand goes far beyond what our eyes can see. It’s what our eyes don't see - a family kept warm by being properly clothed, a child adequately fed and equipped in order to enhance and maximize his or her ability to learn. Pictured L-R: Dan Bates of Fairfield National Bank, Mike Purcell, Newsies 2018 president, Tina Taley, Fairfield National Bank and Molly Bates, Fairfield National Bank. Pat O’Brien buys a Lancaster-Fairfield County Charity Newsies Special Edition newspaper from Newsies Nate Peters Saturday December 12th during the local charitable organization’s ‘Signature Event’- its annual ‘Paper Drive’. 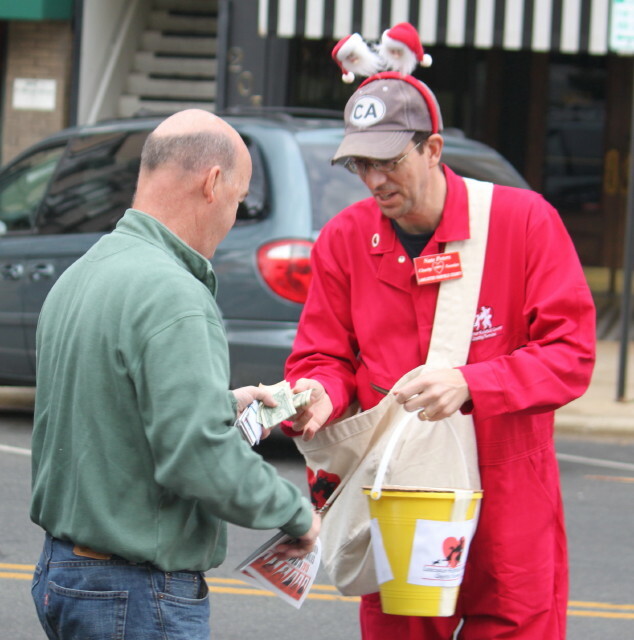 Every year on the 2nd Saturday in December beginning in 1936, members of this exclusively local charity are stationed in front of certain restaurants and store fronts and along major thoroughfares throughout Fairfield County ‘hawking’ its newspapers to raise money for less fortunate families, especially families with children. This year more than 100 members helped raise nearly $28,000 toward the purchase of two weeks’ worth of groceries, delivered by Newsies members yesterday, December 19th, to more than 450 Fairfield County families. The local Charity Newsies was founded in 1936 by R. Kenneth Kerr, then publisher of what is now the Lancaster Eagle Gazette. 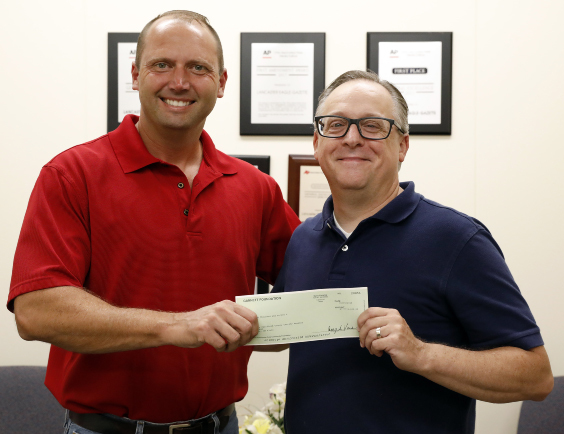 The local daily newspaper continues to partner with Charity Newsies by publishing and donating its annual newspaper and for more than 30 years Charity Newsies has purchased its grocery and sundry items from Dan Bay’s Carnival Foods. Bill Rhonemus, Charity Newsies 2015 2nd vice president, chaired this year’s successful event. The 2nd Saturday in December, for more than seven decades, hundreds of local people have walked the length and breadth of Fairfield County selling our ‘Special Edition’ Lancaster Eagle Gazette -a tradition since the Great Depression and one that has benefited thousands of our Fairfield County neighbors. It all began Dec. 11, 1936, when a group of local businessmen, including R. Kenneth Kerr, then publisher of what is now the Lancaster-Eagle Gazette, met at the Sherman Armory, then located at the corner of Broad and Wheeling streets in Lancaster. Annually, the 2nd Saturday in August in preparation for the new school year, Newsies provide ‘back-to-school’ clothes and ‘teacher-recommended, grade specific’ school supplies for hundreds of area children. On Saturday before Christmas Newsies deliver more than 350 food baskets to families throughout Fairfield County. Throughout the year Newsies assist families who have fallen victim to a home fire, flood or other disaster.